The heavens erupt in the skies above the streets of Byakko City. Points of light flash briefly as the warp drives of carrier ships blink into existence. The Nova Clan’s forces are caught off-guard as a swarm of Void fighters launch to overtake the bustling capital city. The airspace siege cannons of the Void carrier hammer away at Nova Clan’s defenses, and a shadow falls over the city. Masumune has arrived. The gargantuan samurai mech cuts through the enemy forces with ease, obliterating the few remaining Nova Clan ships as they attempt to warp away to a neighboring system. Byakko City belongs to the Void Clan… for now. Welcome to our first preview for Starship Samurai! 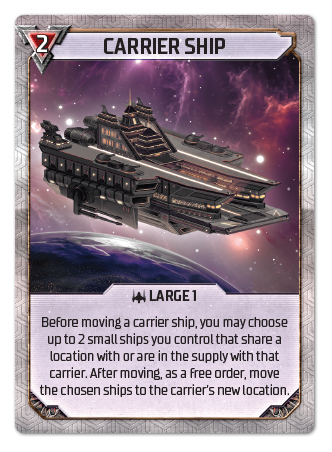 I’m very excited to show fans just how the gameplay of Starship Samurai plays out in your battle for the Lotus Galaxy, from the exciting Order Token system to the powerful Samurai Mechs! Over the next few weeks, we’ll be highlighting some of the different aspects of Starship Samurai, but if you’re curious to see more you can download the rules here. Also, don’t forget that Starship Samurai is now available for preorder from our own webstore and participating retailers as well, and preorders will include a set of acrylic Clan and Player tokens to replace those found in the game. Now, let’s jump into this week’s preview on the locations of Starship Samurai, and how your clan can claim them for honor! In each game of Starship Samurai, a number of location boards will be set out equal to the number of players in the game. Each location board has a space for a location card, a number to determine the order in which battles will take place, and seven spaces to place units such as fighters, carriers or Samurai Mechs. Players will move units from their unit supply to the various locations in play, vying for control of each location (and the reward for that location, which a player can claim at the start of their turn if they have the most power at that location.) Note that once all spaces at a location are filled, no more units may be ordered to move to that location… with one important exception! The Samurai Mechs are powerful tools that can change the course of battle with their imposing size and advanced weaponry. The Samurai Mechs also have another important advantage: The ability to destroy units when moving! Samurai Mechs can be moved to a location board that already has a unit in each of it’s seven spaces. When the Samurai Mech arrives, the weakest ship is destroyed to make way for the gigantic mecha. Be careful, though, as this ship could potentially be your own! Each player will need to keep their wits about them as they vie for control of locations. The best way to ensure your own ships aren’t destroyed my enemy Samurai is to increase their power! Let’s take a closer look at the ships available to players and how they can be used to secure your hold on a location. Players will have more than just their Samurai Mechs to dominate the galaxy with. Each player will control a fleet of 8 fighters and 1 carrier in addition to their Samurai. These ships both have unique abilities that can inform your strategy. 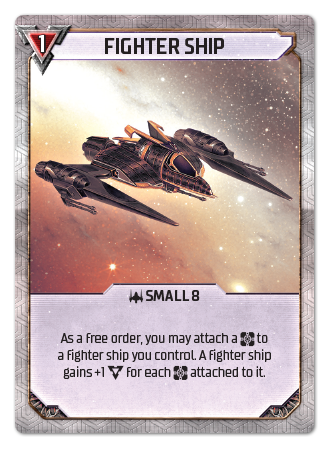 The nimble Fighter is ideal for supporting larger units and using wealth tokens to increase its power, whereas the larger Carrier ship can quickly deploy other ships to aid in securing locations. No matter the strategy you use to claim a location, you must also be prepared to defend it from other Clans intent on invading. You’ll need to deploy your units with care and precision if you want to secure your victory in Starship Samurai! 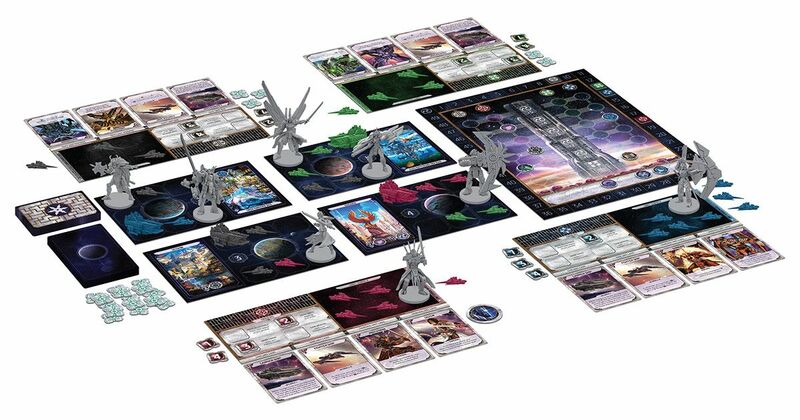 Remember, Starship Samurai is available now for preorder from participating retailers and from our own webstore, and preorders also include a full set of acrylic Clan and Player Tokens! Be sure to join us next week as we discuss the Order Token system and more!